With about 90 percent of Maine covered by forests, it is no surprise that the citizens of Maine want to know that the people who own and work in the Maine woods are managing them with an eye toward keeping them productive for the present and sustained for future generations. That’s where the Sustainable Forestry Initiative (SFI) comes in. 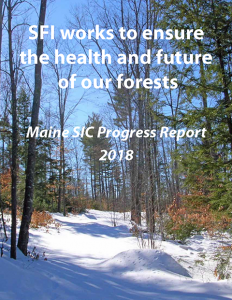 SFI is a program designed to ensure that forests in Maine and across the country are managed sustainably. The Program fosters continuous improvement in forest management by requiring forest professionals – including landowners, loggers, and mill owners – to commit to ongoing research, continuing professional education, and consistent communication with the general public concerning developments within the SFI Program. When we look at the stories and contributions in this report, we have to feel good about the community that’s been assembled by this program over the past 22 years, both at the national level and state level. I’m not sure any of us who were here in the beginning imagined the research that would be conducted or the information that would be disseminated to so many loggers, foresters and landowners by such talented instructors. Nor could we imagine the methods we might use for community outreach to get the word out about forest sustainability, so that people are reminded that using wood from well-managed sources is a good thing. We also couldn’t have predicted that we would be joined by so many amazing partners, who help make these efforts possible and credible. There’s been a lot of hard work by many and it’s paying off. 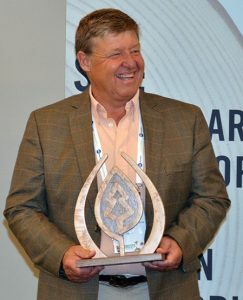 Ottawa, ON — The Sustainable Forestry Initiative Inc. (SFI) announced today that the Maine SFI Implementation Committee is the winner of the 2017 SFI Implementation Committee Achievement Award. This award, announced at the SFI Annual Conference, recognizes the exceptional work of the grassroots network of 34 SFI Implementation Committees across the U.S. and Canada. Groups ranging from Habitat for Humanity and Boy Scouts to universities and Ducks Unlimited Canada work with SFI Implementation Committees. “Education and outreach have long been a strength of the Maine SFI Implementation Committee. Every year we hold multiple events and workshops that involve hundreds of people and benefit our communities. Having these efforts recognized with an SFI award is hugely gratifying,” said Pat Sirois, the Maine SFI Coordinator. “This award really belongs to the network of countless people who care about Maine’s forests. We all share the benefits of the healthy, productive forests that are such a significant part of the quality of life in our state.” Read more. It was like a barn raising – only without the barn. Over three days this summer, volunteers from across Maine’s forest community helped create an outdoor classroom pavilion for the Maine TREE Foundation at the Holt Research Forest in Arrowsic. “Maine TREE is excited about the opportunity to bring teachers, students and the community into closer contact with the research, data and hands-on experience at our own Holt Forest,” said Sherry Huber, executive director. “We are especially grateful to University of Maine resident scientist Jack Witham, Maine SFI Director Patrick Sirois and all the volunteers who pitched in and to those who donated materials to make our Outdoor Classroom a reality over this past summer.” Read more. At SFI we believe the future of our forests and our shared quality of life depend on strengthening the vital links between healthy forests, responsible purchasing and sustainable communities. The U.S. Green Building Council’s move to recognize SFI for LEED credit underscores those links and validates and sustains the many communities and the millions of people who work every day to ensure responsibly managed forests provide the many benefits we cannot live without. The new LEED alternative compliance path (ACP) recognizes wood and paper products certified to SFI, ATFS, CSA and other PEFC endorsed standards. See SFI’s press release announcing the news. Technical fact sheet– walks through the LEED credit requirements. The Sustainable Forestry Initiative Program was a response to the public’s obvious concern about the long-term sustainability of the country’s forest resources. Meet the needs of the present without compromising the needs of future generations. Promote environmentally and economically responsible practices. Improve forest health and productivity. Manage our forests to protect their special qualities. Continuously improve forest management and measure progress.